The long distance runner: Lonely, no more? Recently, Hamilton shared a great post about American ancestry. The first sentence of his post– “This is one of my favorite demographic maps.”— made me wonder: Have I ever said those words? Do I have a favorite demographic map? There are plenty of maps that I appreciate for what they reveal, such as one from this past summer painting a stark picture of US income mobility. Some maps are more for fun: though I wish I had a better handle on the source, I definitely got a kick out of the map revealing the concentration of red-heads in Europe that made the rounds last year. And, of course, the Racial Dot Map was pretty great for both substance and style (though I personally think that the Congressional Dot Map was even more interesting). This week, though, I happened across a great new map that I appreciate not only for its visual appeal and powerful presentation of data, but also because it provides great information on a topic I care a lot about: running. The recent government shutdown and flirtation with default has seriously deteriorated public trust in Congress, and in Washington more generally. Disgust with Washington is often followed by bewilderment. How did things get this way? While there is no single answer to this question, if I had to choose one, it would be current redistricting practices. There is a strong case to be made that political polarization (and associated intransigence and brinkmanship) are rooted in gerrymandered congressional districts. Gerrymandering, the art and science of lawmakers choosing their own voters rather than the other way around, has ensured that most representatives in the U.S. House are safe from general election challenges. Without those challenges, positions taken by elected officials are not exposed to debate and to the typically moderating effect of contested elections. In contrast, in gerrymandered districts where it is clear that one party or the other has a more or less certain general election victory in hand, candidates from the opposing party opt out of running (or have little real chance of winning if they do). As a result, the only threats to these lawmakers come in contentious primary contests from the hard left and hard right. Being “primaried” is now a common term among political strategists, and is often used to describe well-financed tea party challengers who unseat moderate Republicans. As moderation, from either side, is lost in primary challenges, the result is more rigidly ideological victors and the deadlock we see with increasing frequency in Congress. 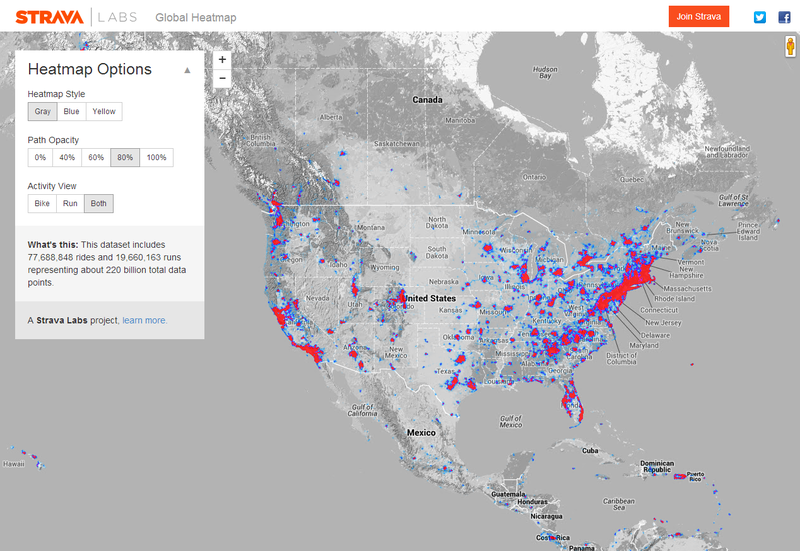 Link to the full interactive Congressional Dot Map. On Monday, the Virginia Senate narrowly passed (20-19) a new redistricting bill that will dramatically change the boundaries of the current Senate districts drawn just two years ago. The plan, passed by Senate Republicans on a party-line vote when a Democratic Senator was away on Inauguration Day, has been criticized by Democrats as an overt attempt to give Republicans an advantage in future elections by “packing” and “cracking” black communities in Virginia in order to dilute their voting power. Republican Sen. John Watkins, the legislator who sponsored the redistricting amendments, instead says the new plan would defuse possible Voting Rights Act legal challenges by creating a new minority-majority district and also cited improvements in district compactness. The move by Senate Republicans is unusual, as such massive changes to a district map are typically reserved for redistricting sessions right after the decennial census. As a result, this recent redistricting drama has garnered much national attention this week and was a top-ten story on Politico.com Wednesday. Now that most states have finalized and submitted their official election results (yes, it does take that long), we can take a closer look into state and local turnout rates for the 2012 presidential election. Obama’s margins over his Republican challenger shrunk in most battleground states and was enough to flip Indiana and North Carolina, the only two states to switch between 2008 and 2012. But despite the slow and tenuous economic recovery, high unemployment, a controversial health reform law, and a slew of other things Obama had going against him during the campaign, nothing much changed. This was also despite lower turnout rates across the country. As a data consumer and user, I am constantly amazed at the pure volume of data currently available, as well as the many analytical tools that enable us to better understand this data and the technology that makes it all readily accessible and shareable. Data can be just numbers on a page, buried in a dry table in the back of some compendium of facts and figures, but when given the appropriate context and made relevant to users it helps us better understand the world around us. 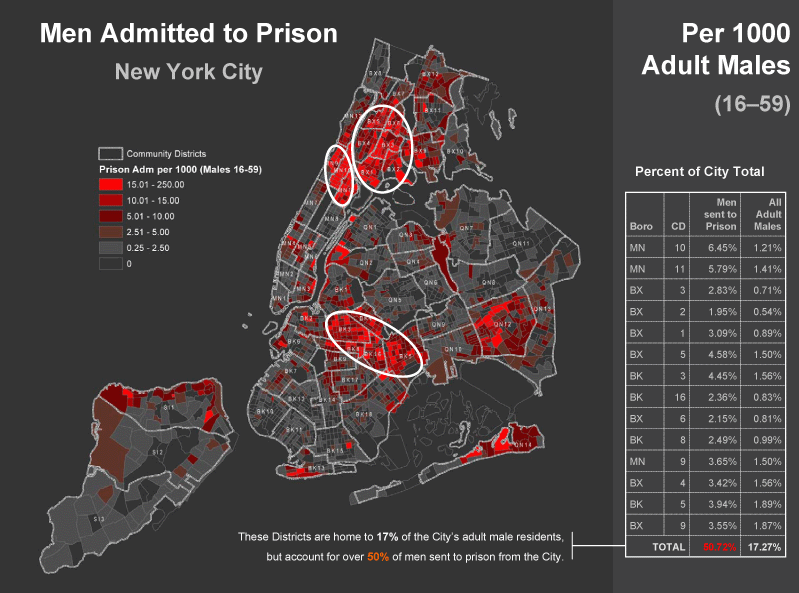 The Justice Mapping Center identifies 3 districts home to half of men who return to New York City from prison.